Q. Are you familiar with Dr. Robert Lustig’s presentation on fructose, called “Sugar, The Bitter Truth” ? What’s your opinion on this? Shouldn’t pure fructose sweeteners (which are marketed as low calorie) be banned? According to this presentation, wouldn’t it be a good idea to substitute all sucrose with a larger amount of maltose? A. Although I respect Dr. Lustig and his work, your questions are the perfect illustration of just how badly this viral video has confused the issue among consumers (and more than a few professionals). Here’s what always seems to get lost in the biochemical mumbo-jumbo: Dr. Lustig’s observations apply to the dangers of excessive fructose intake. Rather than ban fructose sweeteners or replace all sucrose with maltose, there’s a much simpler solution: Limit your intake of all concentrated sweeteners. 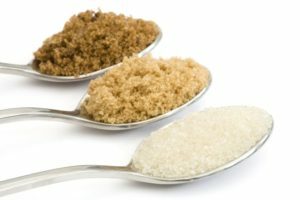 I am convinced–and nothing in the medical literature nor in Dr. Lustig’s infamous presentation has yet persuaded me otherwise–that if you’re reasonably healthy and your added sugar intake doesn’t exceed the recommended 5 to 10% of calories, fructose poses little threat to your health and well-being. What’s worse, this persistent confusion about fructose leads to “solutions” that could make the obesity and diabetes epidemic even worse. While maltose may not contain fructose, it contains the same number of (empty) calories, meaning that it’s just as fattening. And it has an even higher glycemic index, meaning that it would cause an even sharper rise in blood sugar. Talk about jumping from the frying pan into the fire! Here’s the bottom line: Fructose is not the problem. Excessive intake of concentrated sweeteners is the problem. P.S. Like maltose, pure fructose contains the same number of calories as sucrose. But because it does not cause the same rise in blood sugar, it is often marketed as an alternative sweetener for diabetics. It should still be consumed in limited quantities. This Week’s Podcast | Can You Get Too Many Antioxidants? Fish Oil to Reduce Cholesterol? Do you mean that the longterm adverse effects of fructose which he stated are due to an excessive intake or that fructose even gets metabolised differently if the intake is moderate? Anyway, the scare was big enough to make me stop eating sweets at all. Ivan, fructose is metabolized the same way no matter how much you take in. My point is that–as with virtually any other nutrient–the “toxic” effects of fructose apply only to consumption above a certain threshold. But you’re certainly not doing yourself any harm by avoiding sweets!! I’d quibble a bit with you a little on your interpretation of Lustig’s video. His observations weren’t just about excessive fructose intake, they were about added fructose that wasn’t “packaged with the antidote” … i.e, without fiber. So he’s fine with fructose in fruit, but not with sugar-sweetened products; it’s just too easy (especially with sodas in the mix) to go past healthy and into excessive intake. His comments on obesity in infants and formula as “baby milkshakes” were especially compelling IMO. That said, I agree in general with the idea that avoiding concentrated sweeteners — not just standalone, but those in the myriad of processed food products, sweet or savory — is the key whether you’re “reasonably healthy” or you’d like to get that way! Well said! People often overlook the part in Lustig’s video where he says you can eat pure sugar cane and not have problems (it’s like eating a tree), because naturally occurring sugars are so low in concentration compared to those in added sweeteners. Sigh. Eating sugar cane is actually a combination of chewing on the stick and sucking out the juice. One doesn’t really eat it. I agree with Beth. I think Dr. Lustig based his study on the fact that the way we are living today with fructose and sucrose being added to almost everything that comes in a package, it’s virtually impossible to stay below the threshold for healthy sugar intake. The decisions I took after I watched Dr. Lustig’s video were 1) try to avoid packaged foods when there’s a fresh substitute like dairy products and 2) never to eat desserts and sweets that I did not make myself. I still use sugar, it’s very hard not to, but I always keep my intake and my family’s intake with-in reasonable range. When, for example, during the days we used to buy soda and use the actual amount of sugar in a dessert recipe (I now half it and it makes almost no difference), this was almost impossible. It seems that with all such health hysterias one of the core tenets of toxicology is all too easily lost: Toxicity is always a matter of dosage. Or a related phrase: Any bioactive substance is toxic at sufficient amounts. Thank you, Monica, for your levelheadedness. I don’t think that people really forget this. It’s just that things are a little more complicated, especially with chronic exposure (i.e. fiberless fructose every single day). Lustig’s interpretation that fructose doesn’t get used by the body but is tried to get rid of and is thus a poison makes sense. That the poison doesn’t have accute toxicity doesn’t change that it’s a poison. A botox shot to your face won’t kill you, it’s still the most poisonous biological poison. I make a distinction between a nutrient wich can become toxic if present in extreme concentration and a poison which is not yet accutely toxic because the concentration is too low. My response was not limited to severe acute toxicity only. Any biochemical disturbance of an organism’s proper functioning, whether short- or long-term, is a sign of toxicity, even if it’s just a botox shot paralyzing a few of one’s muscles, or mild diarrhea after excessive intake of Vitamin C.
Lustig himself acknowledges that fructose is very well suited for replenishing the muscles’ glycogen stores, so instead of avoiding fructose, one could just exercise more (to a certain extent). Lustig himself acknowledges that it isn’t that black-and-white. Yeah I remember him talking about gatorade and marathon runners, but that would mean that the only time when one is allowed to eat sweets or drink sugarwater is after a workout. Actually that would be a great thing, but the reality is quite different. Since I have just pointed out a beneficial use of fructose, doesn’t it belong to the category of “nutrient[s] wich can become toxic if present in extreme concentration” now? Yet the rest of the time (which really, is the vast majority) it’s malignant. But I doubt that the correct categorization is even of significance in this discussion. When you say: Toxicity is always a matter of dosage. I assume your position is: If you stick to the recommended dose of 5-10% (of calories) added sugar, then the fructose won’t be toxic, since the dose is low. A little bit of poison every day might not have prominent effects, but is that a reason to continue it? You assume correctly; I do not think that the consumption of small amounts of (fiberless) fructose is harmful at all. What a small amount really constitutes in this case depends on the individual’s health, fitness and exercise level. Glycogen depletion does not only occur during physical exercise (e.g. also after a long sleep) and glycogen replenishment does not only occur during or immediately after workouts. That alone is certainly no reason to consume it, but since a “little bit of poison” may not have any harmful effects at all, the actual question should be whether it is rational to stringently avoid it for that reason alone. Of course, most types of specific nutrients can be replaced by other ones, and as has already been pointed out, the processed foods that are typically high in fructose or added sugars in general may very well be regarded as overall unhealthy on their own accounts. And I’d have to take issue with the fact that fructose doesn’t get used by the body. Fructose absolutely DOES get absorbed and metabolized. It’s a different pathway than the metabolism and absorption of glucose and so the effects of excessive consumption are different than the effects of excessive glucose consumption. Note Monica that he stated fructose does not get metabolized by the BRAIN. He absolutely said fructose is metabolized and absorbed in the liver. That is why alcohol makes you loopy and fructose does not. Otherwise, I agree completely that trying to eliminate additional sugars(keeping to the recommendations) is a healthy way to live considering the amount that is added to our food without our immediate knowledge. Yup! The dose makes the poison, as they say! I agree with your post, Monica. I must say, it seems those people who get hung up on one nutrient (fructose, vitamin D, omega-3 FA, etc) or one concept seem to miss out on the whole picture. I don’t mean to be cruel, but these people are still obese and will remain that way until they realize they need to stop worrying about small picture things and think about the whole picture. We are only human and we will never be perfect with our diets. Just my 2 cents. Terri, your assumption that people who worry about single concepts don’t worry about the whole picture and that they are all obese is baseless. Well, of course they aren’t all that way, but that is a pattern I’ve seen. I follow a lot of channels, and let me tell you, it’s not baseless. And I should clarify. My statement is not about researchers. Of course researchers have specialty areas. I’m talking about the average dieter. The average dieter does not need to be hung up on small things. Fructose consumption may or may not be a small thing depending on how you look at it, but if you just limit all sweeteners as Monica mentioned, then it is a small thing.